This is plate 14 from Robert Melville Grindlay's 'Scenery, Costumes and Architecture chiefly on the Western Side of India'. 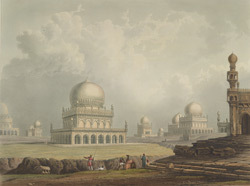 Grindlay (1786-1877) was only 17 when he arrived in India in 1803. He served with the Bombay Native Infantry from 1804 to 1820 and during this period made a large collection of sketches and drawings. These tombs are situated about two kilometres from the Golconda Fort in the present state of Andhra Pradesh. "Amidst beautifully laid out gardens of Ibrahim Bagh there are seven tombs, erected in memory of the departed kings of Golconda. Almost every tomb has a mosque adjacent to it," wrote Grindlay. The grandest of these mosques was the one next to the mausoleum of Hayat Bakshi Begum, the daughter of Muhammad Quli Qutub Shah, which was built in 1666.